On Wednesday 2 August 2017, 30 West Papuan Students from the Papua Student Alliance (AMP) gathered near the US Consular Agency office in Bali to claim West Papua’s independence and to demand freedom for Papuans. The demonstration was organised in commemoration of the 1969 Papuan People’s Free Choice (Pepera), known as the “Act on NO Choice” by Papuans. During the 1969 elections, West Papua’s population suffered tremendous human rights violations and was threatened and obliged to express its willingness to remain part of Indonesia. Around 30 students of the Papua Student Alliance (AMP) Bali held a rally on Wednesday to demand West Papuan independence. They staged the demonstration at a location near the US Consular Agency office in Denpasar, Bali, as the police did not allow them to hold the rally in front of the office as initially planned. AMP spokesman Wolker said the rally was held to commemorate the 48th year of the Papuan People’s Free Choice (Pepera) in 1969. “The Papuan People’s Free Choice was not democratic; [it was] full of terror, intimidation and manipulation. Severe human rights violations also occurred at that time,” Wolker said. In a statement, AMP said that 175 out of 809,337 Papuans cast their vote in the Pepera in 1969 and that all of them had been "quarantined" before the voting day. “Since then, [acts of] colonialism, imperialism and militarism have been committed by the Indonesian government,” it said in the statement. The group’s activists held the rally at the US Consular Agency as they believe the US government interfered in the Pepera. 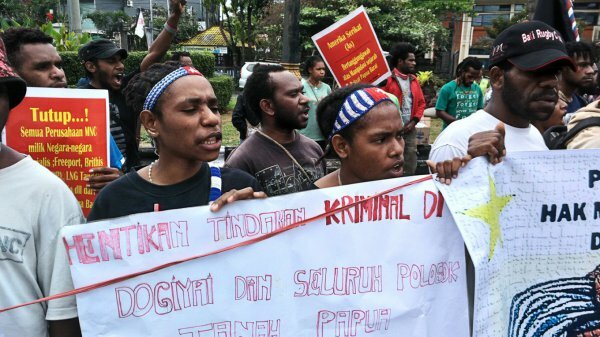 “Papua should get freedom,” they yelled during the rally.